All transactions are safe and secure with a reliable history in online purchasing behind each of our associates. 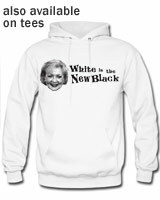 Buy the Betty White Hoodie Sweatshirt to own Hot in Cleveland clothing and merchandise. After her recent role as Grandma Annie in The Proposal and landing a coveted hosting gig on SNL that was the result of an awe inspiring petition from fans, Betty White is the new black! She is everywhere and we are happy about it. This Betty White shirt or hoodies feature the woman who puts the laughs in every project she works on. For more Hot in Cleveland shirts and Betty White sweatshirts featuring this beloved actress, keep perusing our gallery that includes the Free Elka shirt and others. In addition to the Betty White Hoodie Sweatshirt above, browse the Hot in Cleveland Clothing Gallery for more apparel like men's and women's clothes, kids shirts or hoodies.